A nice simple product for the college student moving into their first tiny little apartment with a tiny little kitchen. It’s a simple setting for four, nothing fancy and forces them to stay on top of washing the dishes. Speaking of which, the satin polish means no polishing required. They call it brushed or satin, all these descriptions get confusing. It short, it’s not shiny shine. And a 25 year limited warranty is nice considering the practical price. 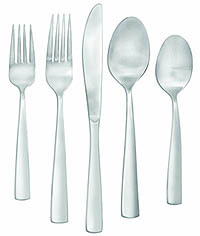 PS – To the student that receives this as a gift, the salad fork is for eating salad. So eat your greens! This stuff looks pretty cool. I’m not sure how sturdy it is, there is always a problem with plastic utensils. 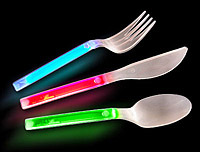 But I’m convinced that it would be the ultimate cutlery for Dining in the Dark. My big concern would be to not break the handle and accidently season my food with biohazardous glowing goo. If anything, you’ll never have a problem finding your spoon under the table if you drop it. More of a novelty than useful. A small fork and combo spoon/knife/food pusher that pops out of a die cut credit card sized piece of plastic. I see this more of an ID card proving that you are indeed crazy about food and silly about cutlery for that matter. A little pricey at $20 but worth it for the looks on your fellow diner’s faces when you attempt to pay for lunch with it instead of a real credit card. Nomad Cutlery. Where you need it, hanging under your chin. When I was a young man, having a beer bottle opener hanging around your neck was very useful. And it meant a lot of people would come up to say hello and leave a small spritz of beer on your shirt. This travel cutlery available at UnCommonGoods.com has the bottle opener and a knife, fork and spoon. Stainless steel with a plastic case and lanyard that comes in black or orange. You’ll never drop your spoon under the table again.